Flooring trims manufacture polymer scotia of the highest standard that is decorated with a durable hot stamp foil that can be manufacturer in any wood or stone effect as required. Some of the key advantages to using polymer scotia are that scotia is easy to cut and shape & can be fitted using pins or adhesives, Scotia can be shaped to fit uneven walls or bay windows by using hot water or air & is 100% water resistant, made from 75% recycled materials that are 100% recyclable making them environmentally friendly, Polymer Scotia is available in a standard range of colors or can be supplied in any match dependent on the volume required, Scotia can be over painted if required with standard gloss paint. 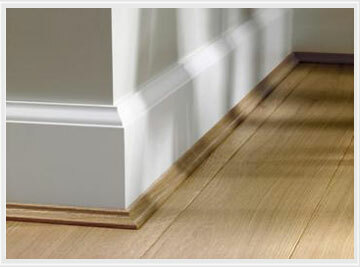 Scotia is primarily used when flooring is laid & skirting board is applied to the top of the laid flooring, this produces a natural looking style element to the surrounding edge & beautiful finish. Primarily flooring trims provide bulk flooring & plastic extrusions for retail & building industry, we are the largest manufacturer within the United Kingdom & supply worldwide, The following information is for the use of Scotia. Follow a few simple steps to find your scotia qty requirements. Step 1 = Take measurements of each room perimeter e.g living room, hall, bedroom. Step 2 = Always allow of an extra 10% for excess waste/mitres. Step 3 = Almost all scotia is produced in 2 & 2.4 linear meter lenghts. Step 4 = Ie. A room that is 10.00m x 7.2 meters gives a total of 34.40 linear meters. 14.4 divided by 14.40 (scotia length) = 14.34 lengths. This needs to be rounded up to 15 lengths. You will require 15 lengths.